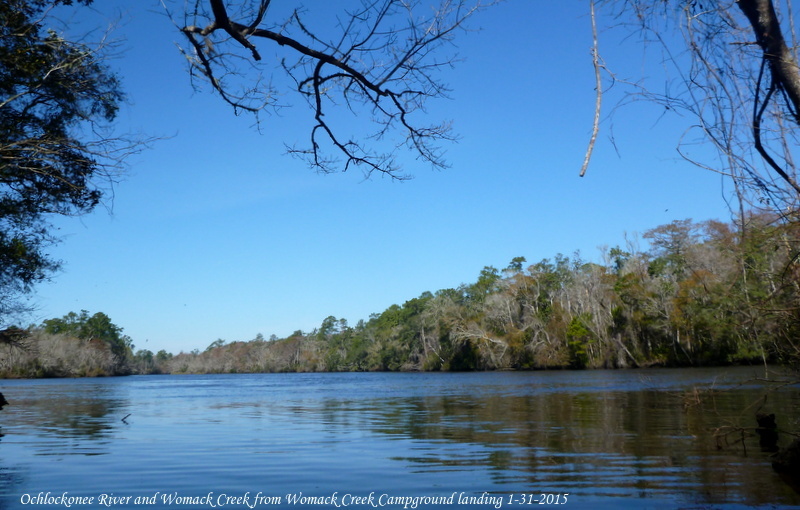 The last day of January, 2015 and spring is inevitable on Womack Creek! January 31, 2015: the weather was crisp. We wore layers and long sleeves on our paddle on Womack Creek. It was 56 degrees at 11:30, the tide was coming in, a slight southerly wind which with the incoming tide created patterns on the water we have never seen before. The creek never stays the same — always something new, always something comfortingly same, but not the same. Spring has started on Womack creek. 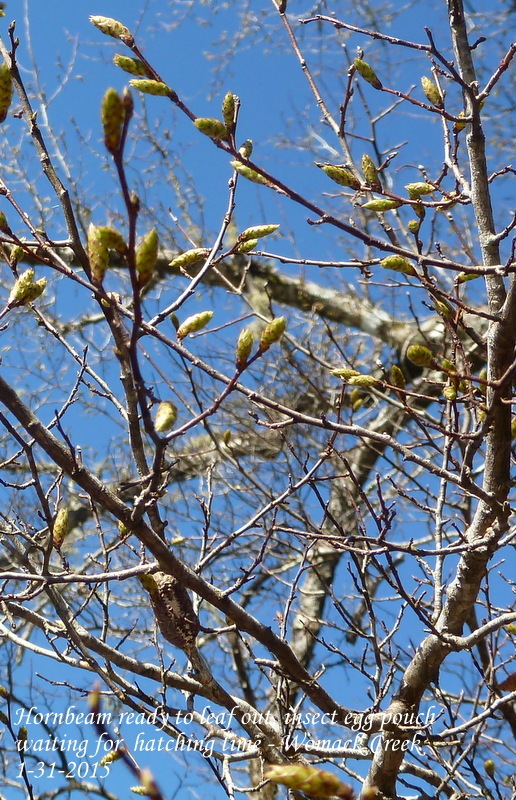 The green leaf buds of sweet gums and hornbeam gave a light green sheen to what were bare branches earlier this month. 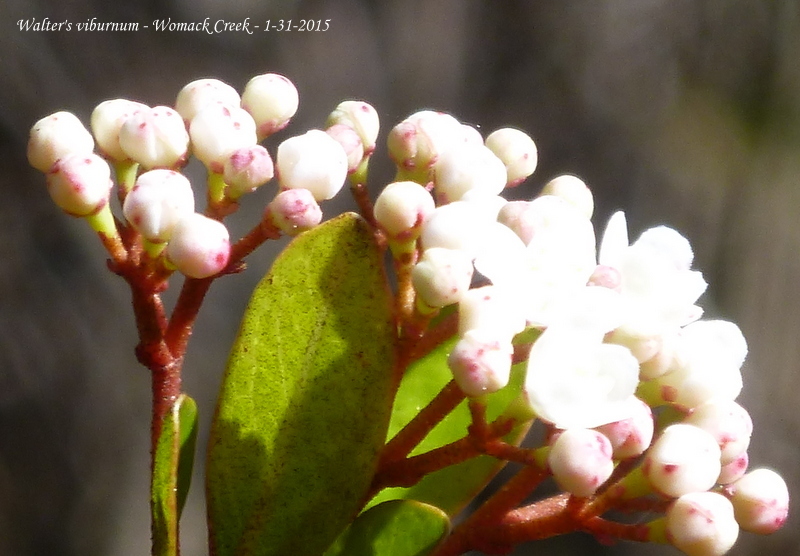 Walter’s viburnum, one of the earliest flowers along north Florida’s creeks and streams, were in heavy bud, their leaves following. The water oaks are dropping their leaves, the swamp roses upriver near Nick’s Road primitive campsite are fully leafed, on the lower 2/3’s of the creek just now beginning to show. Three new Japanese climbing ferns were discovered, which we have been given permission to remove properly. We did not have plastic bags (to cover them with so the spores will not drop) and a spade, so we will do this on our next paddle. Other than that, there are no invasive plants along the creeks or in the water. We hope to keep it this way. 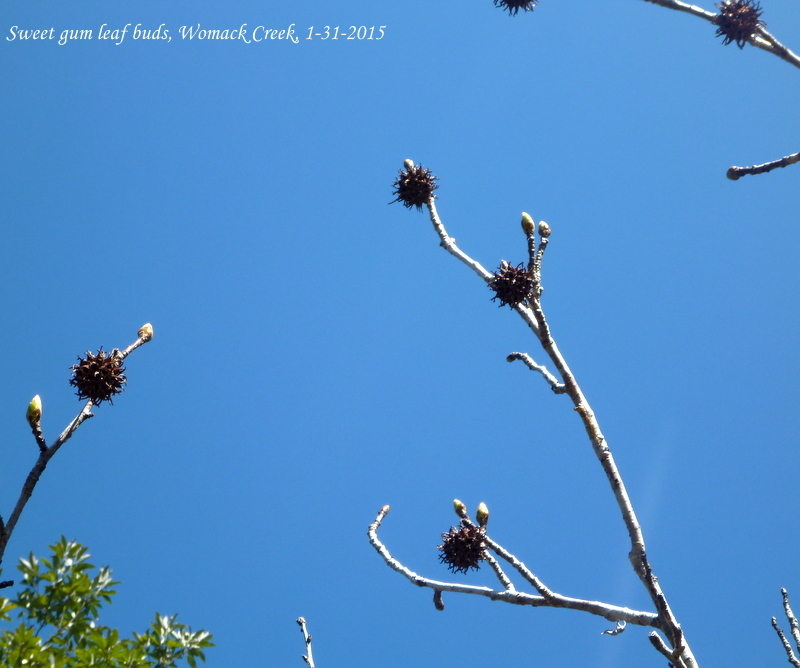 The Florida red maples are beginning to form their characteristic winged seeds. Some were still in bloom, some beginning to develop seeds, and others with seeds quite pronounced — a palate of sequence of bud, bloom, seed. 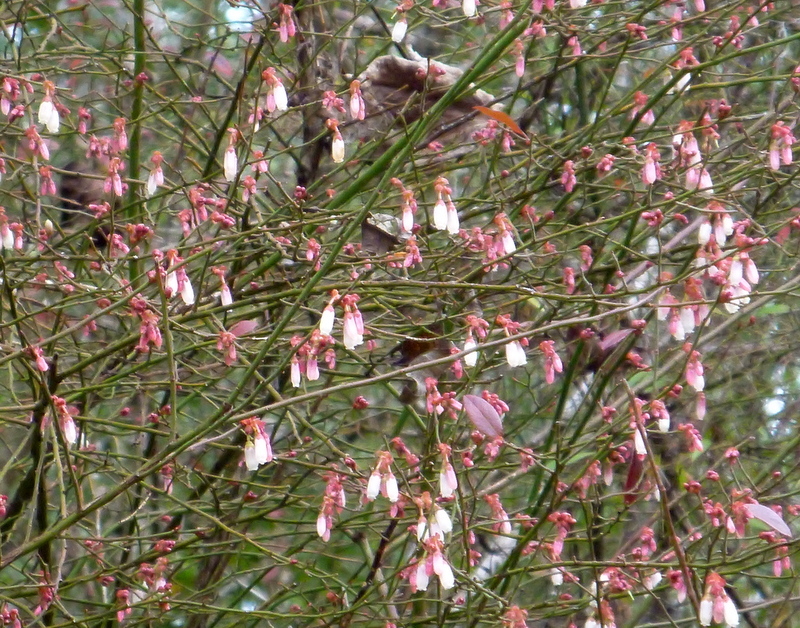 Along the branches, some more sheltered than others, leaf buds and flower buds were also forming. 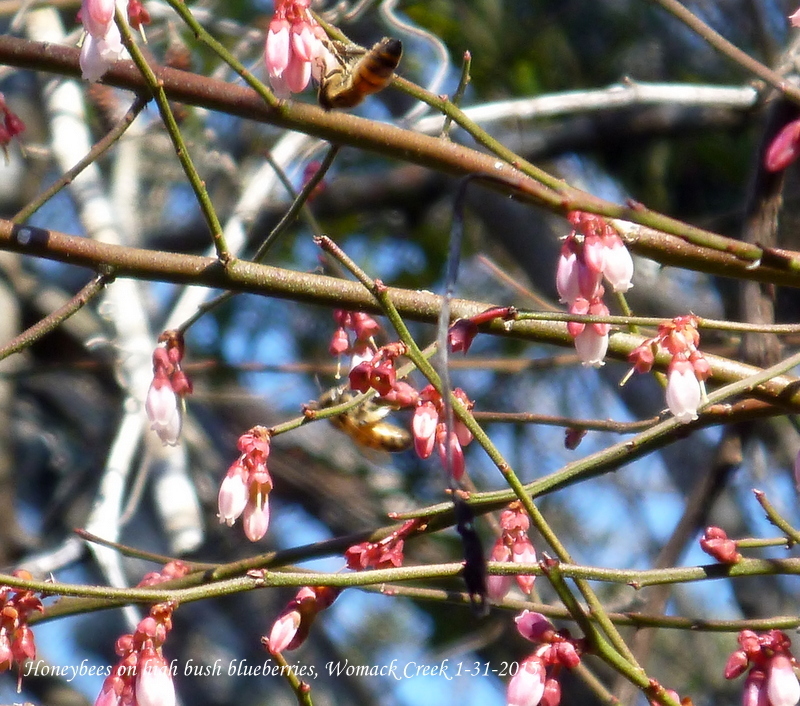 High bush blueberries are in full bloom and the first honeybees were gathering nectar and pollinating these blossoms. Last year the bounty of fruit was such that we were able to munch on more without guilt, leaving lots left on the bushes for birds and animals who depend on the blueberries for food. The dahoon, yaupon and American holly berries which were still visible on the shrubs earlier have been stripped — possibly by a flock of migrating birds. 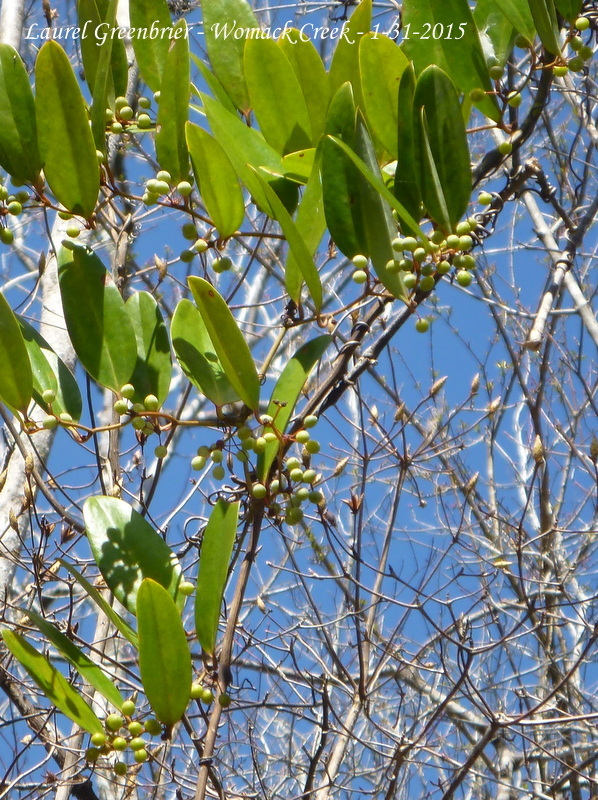 But up high, the berries of the laurel greenbrier (smilax) are forming. Bears like to eat these berries which form 18 months after flowering. And what of birds? We saw and heard a red bellied woodpecker, great blue heron, several ducks, what we think is a grey catbird, the ubiquitous kingfisher — we would feel slighted if it didn’t make a show somewhere along the creek — a hawk, buzzard. And a sound we have not heard this year — a barred owl messaging across the creek and receiving a response. Camping at the Womack Creek campground, the sound of these owls are soothing enough to bring on sleep. 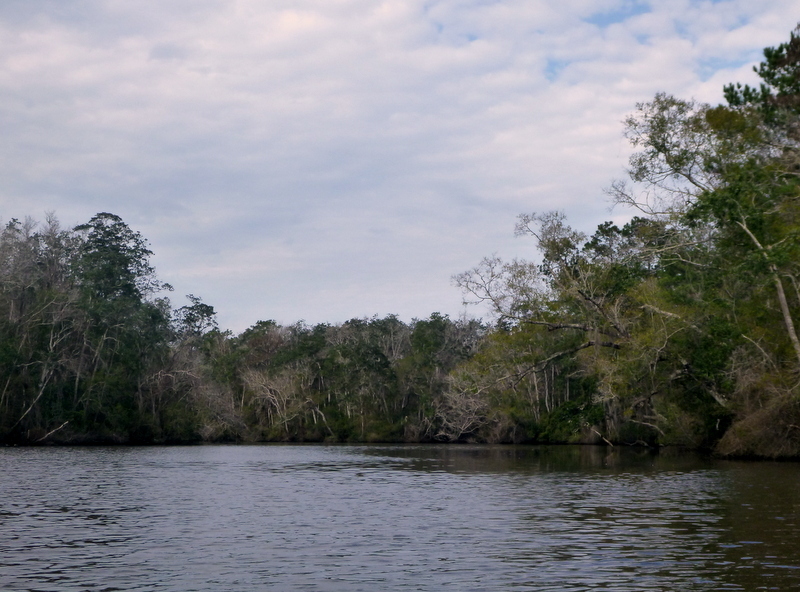 And, the lead kayaker, saw a spot of grey and black at creekside, turn and amble back into the palmettos — a racoon. These little sightings always make a paddle, just as the sounds of the barred owl are comforting that all seems well on the creek. The campground had five sites filled with, we think, hunters — no one was in the sites. The only campground in Tate’s Hell with hot showers and flush toilets, we have always wondered why more hunters have not before availed themselves of these amenities for $10 a night. 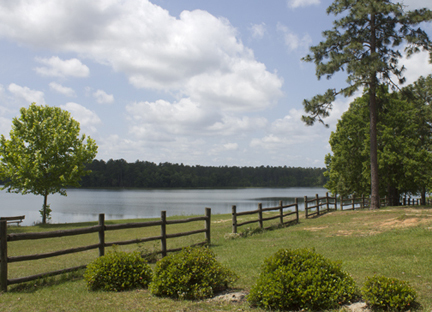 This year they have — we’re glad to see others enjoying the campground and facilities which are kept up immaculately by Mack and Lee, the campground hosts. It was a wonderfully blue, crisp day of paddling under blue skies with the forest and the forest creatures beginning to stir. We don’t have winter like further north, but we do see the seasons on Womack Creek and spring is inevitable! This entry was posted in Tate's Hell State Forest, Womack Creek and tagged Tate's Hell State Forest, Womack Creek, Womack Creek paddling on January 31, 2015 by marylynanded. 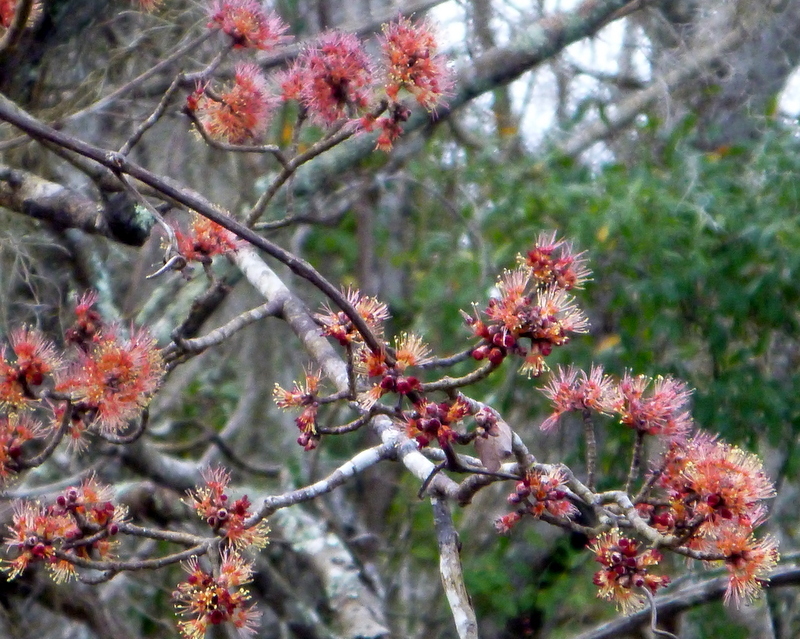 This entry was posted in Blackwater River State Forest, Hurricane Lake, Uncategorized on January 20, 2015 by marylynanded. A cloudy day, 58 degrees at put-in, but no breeze — Ochlockonee River running high. 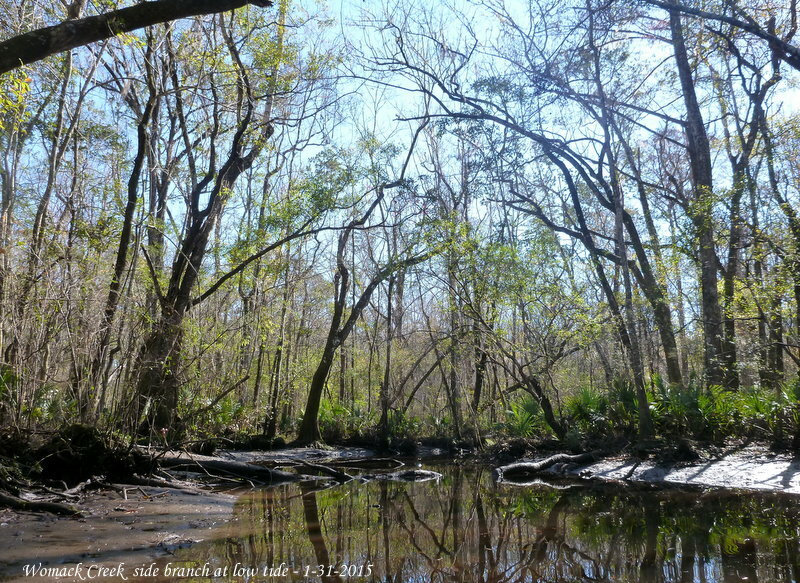 This is where Womack Creek meets the Ochlockonee on the east side of Tate’s Hell. We put-in at the Womack Creek campground. There were no campers, but the hosts were home — Mack and Lee are doing a marvelous job of maintaining this and other east-side campsites in Tate’s Hell. 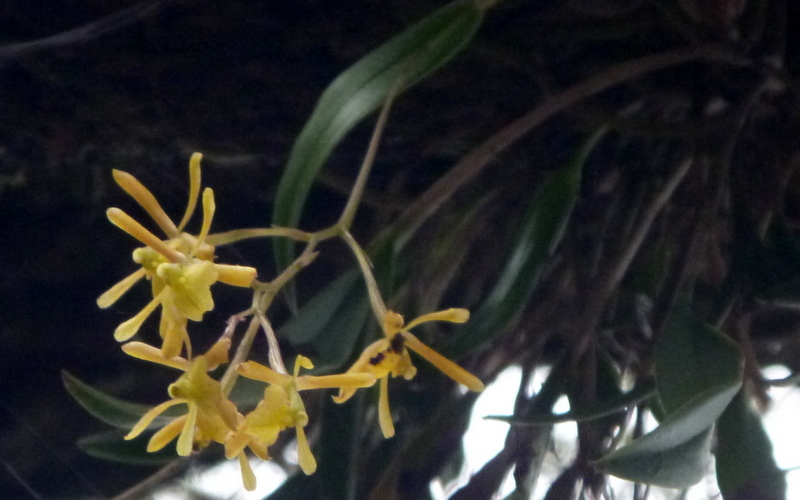 In mid-January, after three nights of freezing temperatures, we were not expecting flowers. 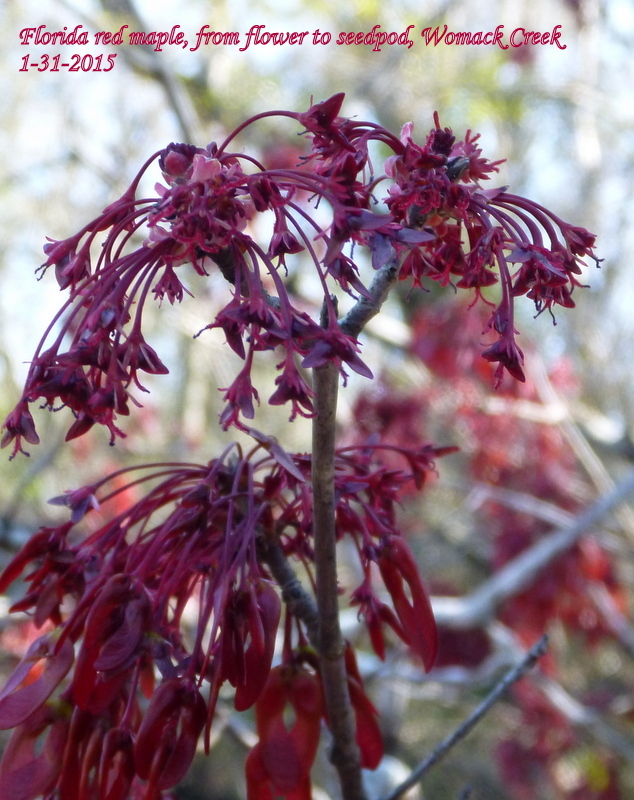 But there it was, at the entrance — a brilliant display of Florida maple in bloom. 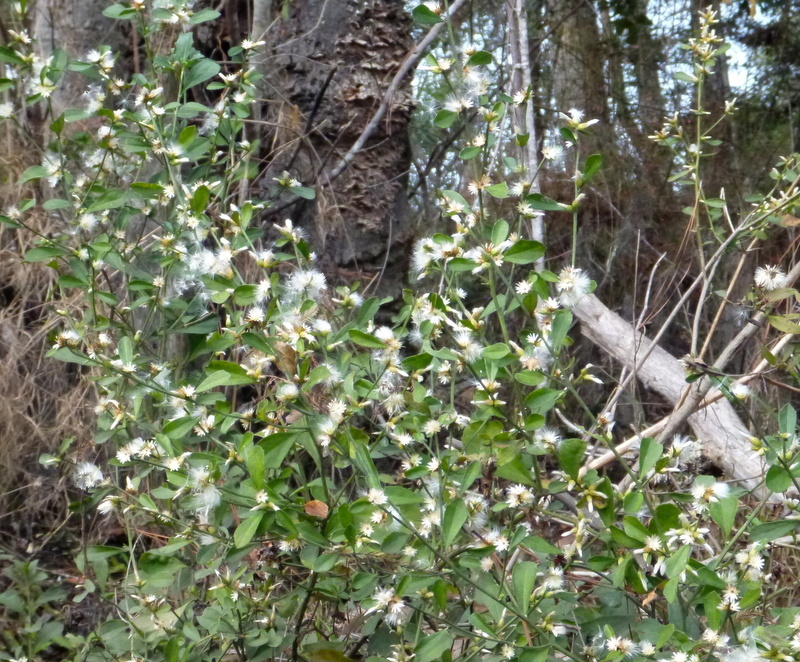 And soon after and thereafter, upriver, high bush blueberries, promising fruit in late May and June. Surprisingly without insects, but bees shall soon be gathering nectar when it warms. 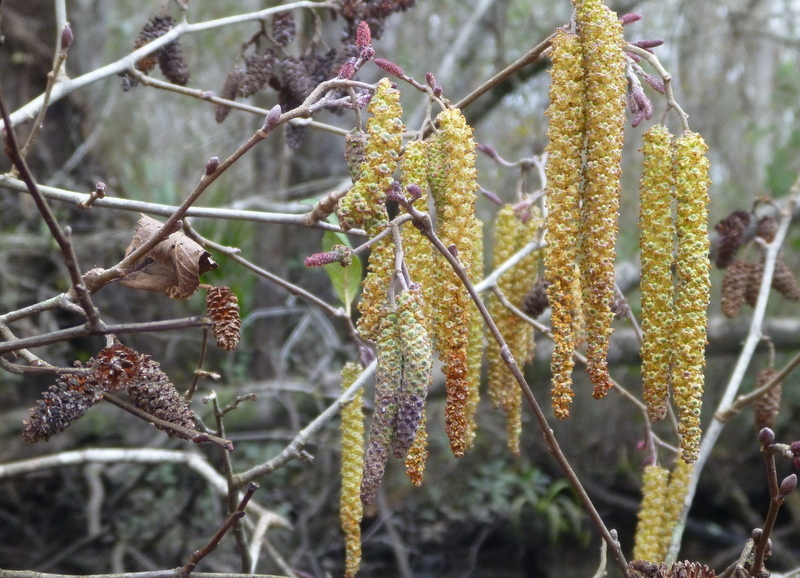 The alder catkins were not unexpected — we see them in late winter. Their seeds still remain on the branches. The subleties of hue and shape which nature gifts us on this river cannot be overestimated. But there were remnants, too, of last summer and last fall. 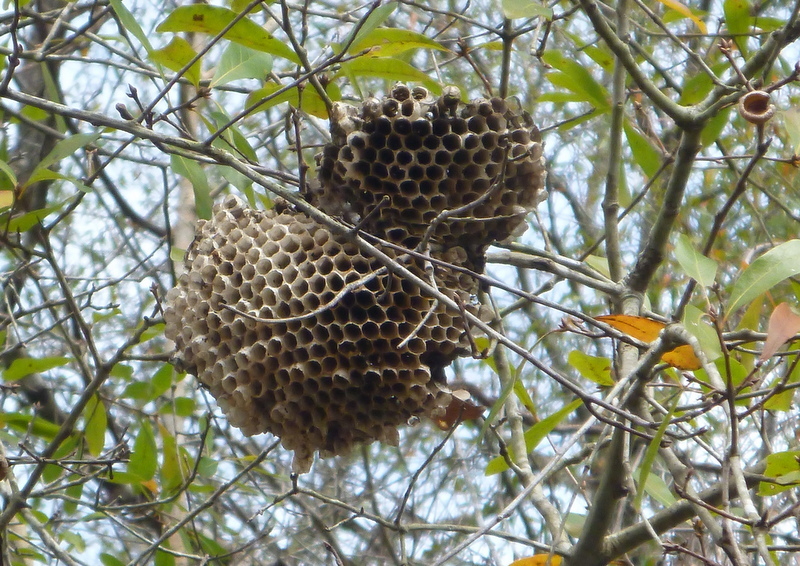 A pair of hornet’s nest and the furry seeds of silvering which bloom in late fall. With no breeze to speak of and the tide at turning point, it was a calm paddle up and back. Paddler’s Guide to the Flowering Plants of Womack Creek”) because we were told that plant collectors can be avaricious and will harvest them if they know where to look. There are more plants in other locations in Tate’s Hell, but we have never seen them in bloom. Too cold for alligators and even turtles, but there were 3 female cardinals, a gold finch, the always present kingfisher, a cormorant, a buzzard, a woodpecker, a thrasher and a flock of unidentified gray birds. No insects, either. While eating our lunch of jerky, crackers, kumquats and for dessert a Perugina chocolate-hazelnut “kiss” each at Nick’s Primitive Campsite, the clouds parted to give us sun. We had the warm blessing of the sun on the paddle back to the Womack Creek Campground. A lovely 7.7 mile round trip paddle. 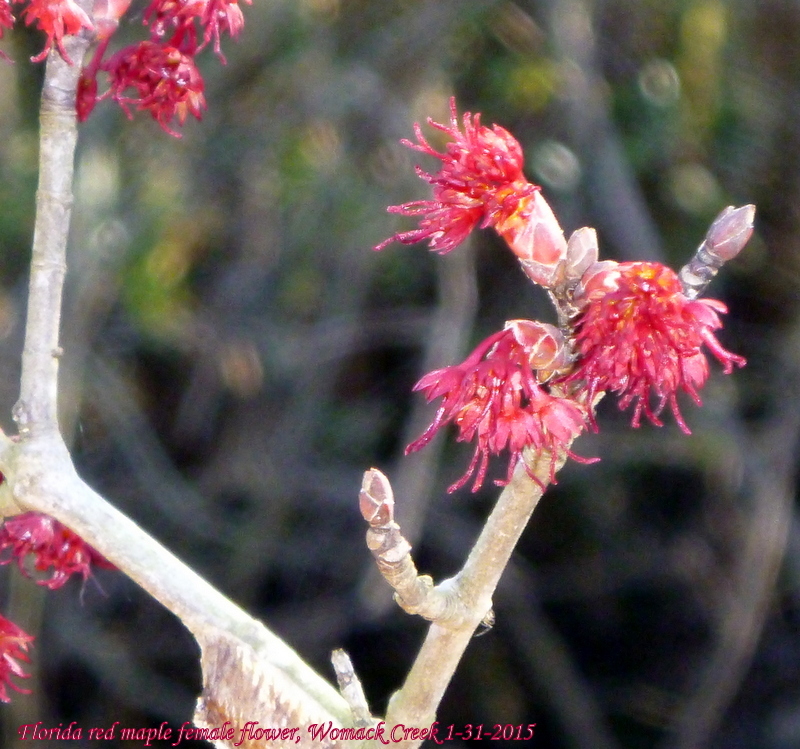 This entry was posted in Paddling, Tate's Hell wildflowers, Womack Creek and tagged Paddling Tate's Hell State Forest, Womack Creek on January 11, 2015 by marylynanded.